Here is a beautiful reminder from DT member Vicki Romaine, that you still have time to enter the Vintage Red blog challenge! Any medium is welcome, on the theme of Vintage Red, and linking up your piece enters you in the drawing to win $10 gift credit at Lunagirl.com. 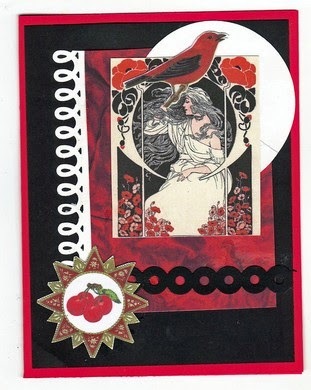 Vicki: "I made a red collage card using a number of Lunagirl images as well as the red background image. Trims were made with border punches." Beautiful work, Vicki -- see more sample pieces from the Lunagirl Moonbeams DT and link up your own work here.